Further to my previous post about the upcoming Turner from the Tate exhibition which opens in Australia in February 2013, I’ve been spending some time looking at Turner’s Venice watercolours and drawings. It’s striking how many times he depicted scenes from the window or on the rooftop of the Hotel Europa, where he stayed during his visits to Venice in 1833 and 1840 (on his first visit to Venice in 1819, he had stayed at the Albergo Leon Bianco near the Rialto). When I first read that Turner stayed at the ‘Hotel Europa’, I immediately pictured the present day Hotel Europa e Regina (behind San Moise). But a bit more delving made me realise that this was incorrect. Turner’s‘Hotel Europa’ is in fact Ca’ Giustinian, which since the mid 1940s, has been the headquarters for the Venice Biennale. The building is located between Calle del 13 Martiri and Calle del Ridotto, just behind San Moise. 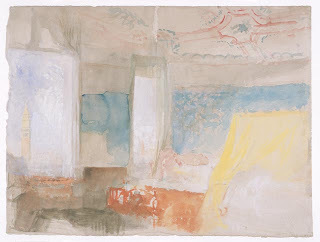 During Turner’s final stay in Venice, he seems to have used his rooms in the hotel as a temporary studio. The view from his room looked out towards the Campanile of San Marco to the east, and from the top of the building, he could look across the Grand Canal to the Dogana and the Salute. Turner also sketched the exterior of the Palazzo Giustinian in 1833. Ca’ Giustinian was formed in the 16th century when two buildings, Ca’ Giustinian (1474) and Ca’ Badoer-Tiepolo were joined. In 1750, it passed from the Giustinian family to the Morosinis. In 1817, Arnold Marseille bought the building, and turned it into the ‘Hotel de l’Europe’. Giuseppe Verdi - he stayed in a room with a private drawing room and piano, and composed part of Ernani (1843) and Rigoletto (1851) here. Théophile Gautier wrote some chapters of Voyage en Italie (1852) at the hotel. Marcel Proust and Francois-Rene de Chateaubriand were guests at the turn of the 20th century. I'm looking on internet of best hotel in Venise. But accidentally I found your blog. I read it and I can say, Your hotel is amazing. I hope we can come here soon. Thank you so much for letting us know this one. Anyway Not convinced? Find out more hotel venisehere.